First, to see my friend Steve’s new house. He moved in June and I needed to see the “before,” before he got rid of it. Second, to enjoy a summer evening with my friend Erin chatting on her patio, whenever I’ve visited her for the last few years it’s been too cold and rainy to be outside! Both goals were achieved. 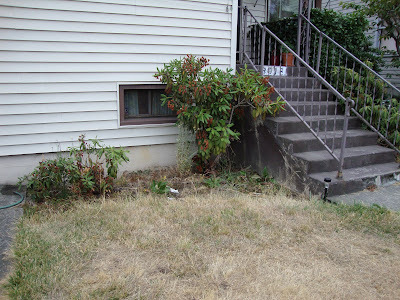 This is Steve’s first house; it’s full of possibilities and a lot of previous owner “issues” to overcome. He’s been busy pulling up shag carpeting and tearing down dated wallpaper but has still managed a few garden improvements. 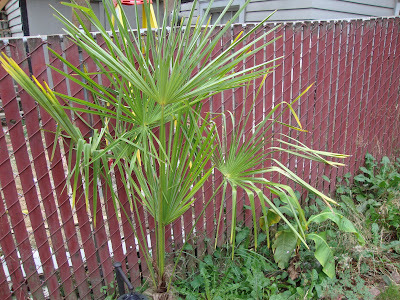 Like planting this Trachycarpus fortunei (below) and Musa basjoo (above) – by next spring he should be well on his way to disguising the neighbor’s "estate" and the chain link fence. He’s also shopping for some nice screening bamboo. In the front yard he gets to start with these “healthy” foundation plantings and “landscaped” side yard. Lots of room for improvement! 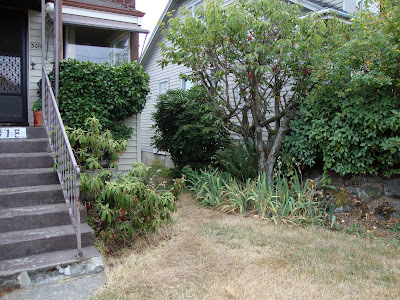 And a blank slate of a backyard, with a huge lilac (on the left) and a mature laurel hedge. I have no doubt that next summer I will be posting some amazing pictures of the transformation! I am in love with this. 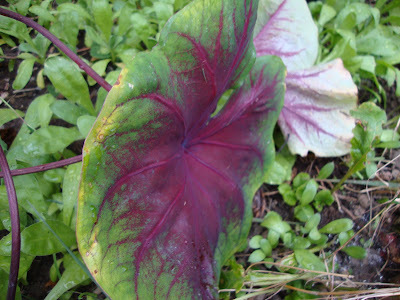 I’m assuming it’s a Caladium? I need one with these colors! He’s hoping that someone can identify this volunteer. It sprouted up in the dead lawn and so far is looking like a keeper. Anyone know what it is? 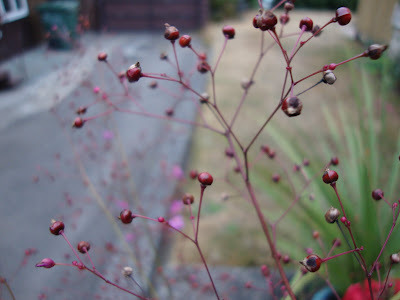 He planted up a few pots to anchor the end of the drive; one has this fabulous airy plant with the burgundy balls on it. Inside the house I was excited to find he bought a Bullet Planter! 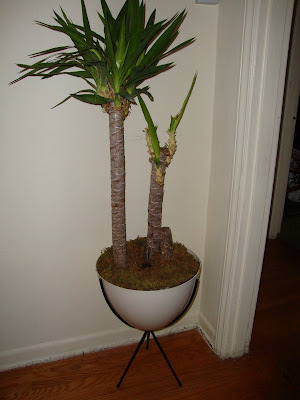 I LOVE bullet planters, just wish they were a little more affordable. We went out for coffee Saturday morning, to a Starbucks in disguise! The 15th Ave Starbucks on Capitol Hill is now 15th Ave Coffee and Tea…only it’s still a Starbucks! The only place you see the name is on the door where it says “inspired by Starbucks” – but it isn’t inspired by, it is! The cups and napkins have no name on them, the staff dresses in street clothes (no uniform apron), the décor is NW Salvage/Industrial. They even serve beer and wine. So you have a company that built this huge brand, and now they are hiding it? Interesting. 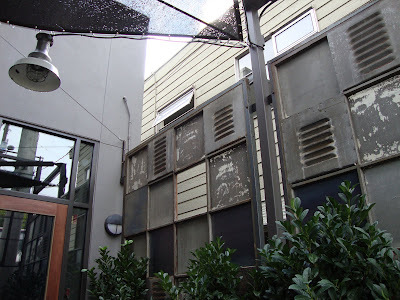 We did enjoy the courtyard; it was very private and well done. 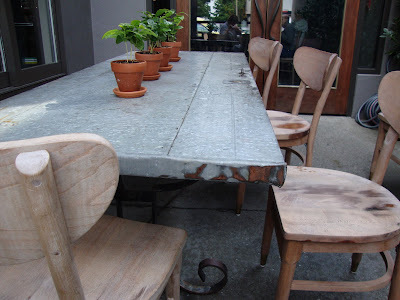 The plants are in whiskey barrel halves and the table is an old door. BTW I read an article in the Seattle Daily Journal of Commerce quoting a Starbucks employee who said the reason for the new look was to “inspire people and to create a deeper connection to coffee and community.” I wonder why can’t they can’t do that and still keep their name? I haven't been in the fancy new beer & wine Starbucks-but-not-Starbucks places yet. I can't tell if you liked it or found it odd. I've read some stories about a shop in New York that a blogger was saying he didn't think would make it. He thought it was a weird mix, to try to present the shop like it was a local indie shop when it's actually a Starbucks. I'm not sure where I fall yet, I'll have to see one to make up my mind. I get Starbucks coffee regularly (on account of the addiction) but their brand seems so damaged these days, so I'm relieved they at least know they have a problem, whether or not they have found the right solution. Of course if I could just count on reliably good coffee/good service I'd be happy without a rebranding/unbranding effort. However, I still have a hard time picturing going to a Starbucks after work for a drink. Well Megan, I'm glad you asked (you did ask right?). Steve wanted to go take me to a neighborhood place but I really wanted to go to Starbucks, I LIKE Starbucks, I don't have any of those negative big corporate issues with Starbucks that some folks do. It's reliably good coffee and after a night of hanging out and drinking wine I needed some good strong coffee. But the coffee SUCKED! I always order the same thing and it didn't taste anything like what I wanted. And the pastries were dry and bland. So on a actual food and drink level they scored a zero. Oh and the guy filled the cup so full that when I put the lid on it spilled all over the counter! Nice. Why couldn't he put the lid on for me like they do at the real Starbucks? On to the other part of the experience, the decor. I really liked the way it looked. I could feel that I was totally being sold an experience but I could overlook that because I liked the experience. It was a very cool place to hang out. Except for the whole CREEPY thing about the fact that I was at a Starbucks owned store that was hiding the fact that it was a Starbucks. So it all felt fake. Very fake. Not good. I won't be back (ok it's not like I would just drop-in anyway but next time I am in Seattle I won't go there). So there you have it, my review. Oh...and I forgot there was a table of people setting around tasting wine. They had score sheets and were tasting and scoring, they might have been employees I couldn't tell. It was 10:30 am! It added to the odd fake sort of surreal feeling. Looks like he has a nice yard to work in! Can't wait to see what he does with it. My son is in the coffee biz (Ristretto Roasters, one on 42nd off Freemont & one on N Williams...one close to you, no?) so I hear a lot about coffee politics, and the nuances of aroma, flavor, etc. quite similar to wine. I am not that much of a connoiseur, but after a RR coffee, it is hard to go back to "Charbuck's" unless I am on the road. Not one to jump on the "bash them because they are so auccessful" bandwagon, SB seems like a pretty decent company fishing around for ways to deal with growing pains. MTJulie, oh my...you do have point there! I wonder if they would put it in a paper cup with a lid so nobody would know!? 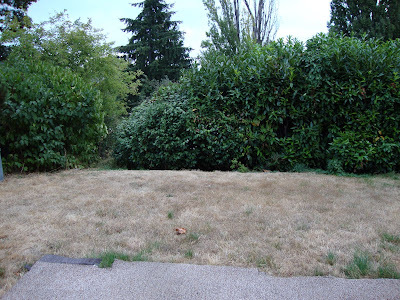 The really nice thing about Steve's yard is that he doesn't have to un-do a lot of previous owner landscaping. He can just start right in with things the way he wants them. I think there's a possibility your friend's mystery plant is a baby madrone (Arbutus menziesii). 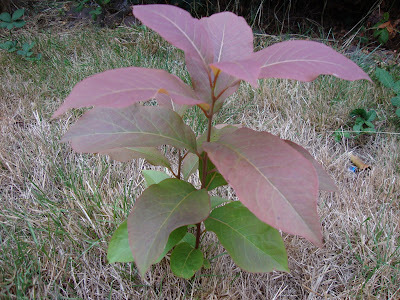 If the leaves are a little bit leathery, and the trunk is reddish, it may be one. 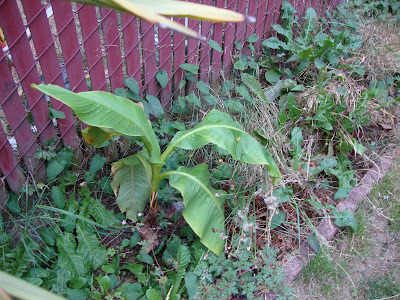 We had a very similar size and look plant volunteer in our back garden this summer, too. I'm thrilled, if ours is. I really wanted a madrone in our plan although we thought we didn't have the right situation for one. But if this is a volunteer, that clinches it, although we will have to move it a short distance. Your friend should not water the madrone, if he wants to keep it. That's apparently the kiss of death. If he wants to move it, now's the time. They don't do well with moves and transplanting when they get bigger. Good luck to him!